Hey there, gang. Tash Moore back to hammer out another awesome (confusing) review for the Mighty Thor from back in the day. And by back in the day I mean when people still wore belle bottoms and said the word “Jive” to each other. While not a great time for TV, it was a very creative time for comics. Comic creators were really hitting their stride, tons of great stories came out and one of the best was the John Buscema Thor run. Probably one of the best all around artist in the business of all time drawing the Thunder God. You can’t go wrong. But this issue gets even better because John’s brother Sal Buscema is doing the art chores this time around. It's win/win. that he sold Sif and Karnilla into slavery to a group in the Dark Nebula. 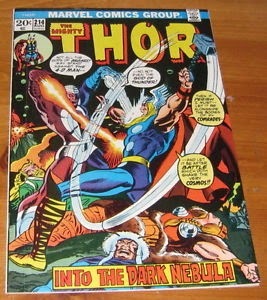 Thor and the Warriors Three and Odin jump into their space boat and head on over there. Thor and crew run into some intergalactic miners. The miners seem hell bent on protecting the secret of the mines. The miners tell Thor that pirates have been coming to steal what they are guarding and about sixty of their crew have already been killed. One of the miners has seen and may know where Sif might be on the planet if Thor will help them keep the mines safe. Of course, Thor agrees and it’s an alliance she wrote. So the pirates are back and they are led by Mecurio the 4th Dimensional Man! Remember him? If you don’t check out my review for The Mighty Thor #208 right here. OK, you up to speed? Good. Mecurio and his whole race are fighting Thor and his gang of gods and it’s a battle royal. Mecurio says he needs whatever is in the mine to save his planet and his people. Mind you, he never once blurts out just what it is he has to do to save his people. I’m pretty sure that if he said what he needed, Thor would have just thrown down his hammer and then loaned Mecurio the $400 and saved his people. Or whatever he may have needed. During the big fight, the three miners jump into a shaft and give themselves to whatever was living in the mine.